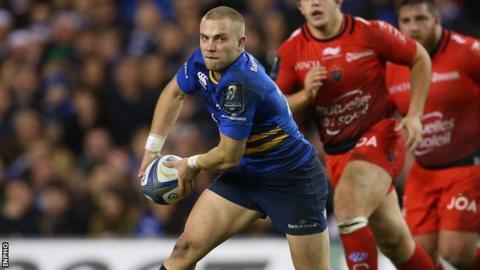 Leinster have confirmed that Ian Madigan will leave the Irish province at the end of the season to join French Top 14 side Bordeaux Begles. Fly-half Madigan, capped 25 times by Ireland, said he believed the "timing was right" to make the move to France. "This was a very difficult decision for me to make, leaving the club that I have represented my whole professional life," said the 26-year-old. "I look forward to experiencing a new life and style of rugby in France." Madigan has played 135 times for Leinster to date, amassing 765 points and scoring 24 tries since making his debut in May 2009. He has won two Heineken Cups, a Challenge Cup and two Pro12 titles during his time with the province, and has also been part of Ireland's Six Nations-winning squads in 2014 and 2015. He has however found himself behind Johnny Sexton in the pecking order at Leinster and Ireland for much of his career, a role he has occupied again since Sexton's return from Racing Metro in the summer. The player was also understood to be a a target for Bristol and Harlequins, but opted to make the move to France despite a warning from Irish Rugby Football Union high performance director David Nucifora that "players that go [abroad], leave themselves at a disadvantage". Madigan excelled in Ireland's 24-9 victory over France that set up a Rugby World Cup quarter-final against Argentina, stepping in for Sexton at short notice. The fly-half was unable to repeat that performance against the Pumas however, as Ireland slipped to their sixth World Cup quarter-final defeat. Bordeaux are currently fifth in the Top 14 and bottom of Pool 2 in the Champions Cup, behind Exeter Chiefs, Clermont and Ospreys. "It is a challenge I'm looking forward to. Bordeaux are a team that is making strides in the Top 14 and in Europe and I look forward to being part of that journey," said Madigan, who can also play at centre. "There is a huge few weeks and months ahead with Leinster, and I look forward to playing my part and trying to finish the season out as strongly as possible for them." Leinster head coach Leo Cullen described Madigan as "a tremendous servant to Leinster and Irish rugby". "We fully understand his motivations for deciding to join Bordeaux and wish him well for the future," said Cullen.